The second half of 2013’s browser war has begun. 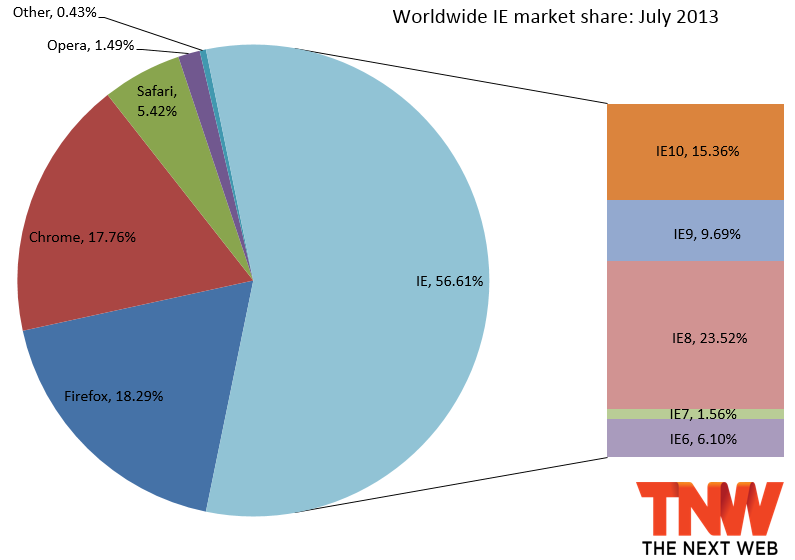 July saw the fourth full month of IE10 availability on Windows 7, as well as one full month of Firefox 22 availability and the release of Chrome 28. The latest market share numbers from Net Applications show Chrome was the biggest winner last month. Between June and July, Internet Explorer gained 0.46 percentage points (from 56.15 percent to 56.61 percent), Firefox lost a solid 0.86 percentage points (from 19.15 percent to 18.29 percent), and Chrome grabbed 0.59 percentage points (from 17.17 percent to 17.76 percent). Safari meanwhile slipped 0.13 percentage points to 5.42 percent and Opera slipped 0.09 percentage points to 1.49 percent. 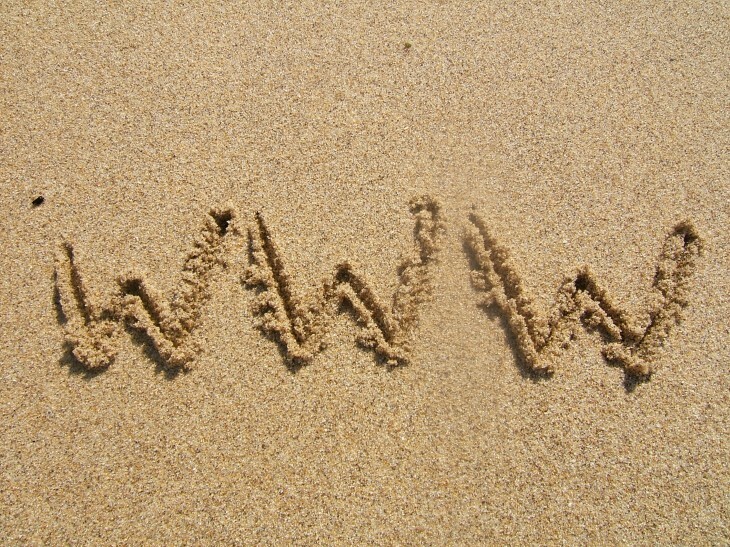 At 56.61 percent, Internet Explorer has hit a new high for the year. January was the first time the browser went back above the 55 percent mark, and while the next few months have shown it won’t be losing that crown anytime soon, it still has a long way to go before the 60 percent mark. At 15.36 percent in July, IE10 has slowed its growth, but still managed to grab another 1.84 percent share. Meanwhile, IE9 has lost a solid 2.02 percentage points, falling to 9.69 percent. Soon IE11 will be following in its predecessor’s footsteps, given that it will be available for both Windows 7 and Windows 8. IE8 meanwhile somehow managed to grab 0.85 percentage points, and it’s still the world’s most popular browser at 23.52 percent. The real tragedy here is that IE10 is mainly stealing share from IE9 on Windows 7, since Windows XP users can’t upgrade past IE8. IE7 was down 0.13 percentage points to 1.56 percent and IE6 slipped just 0.03 percentage points to 6.10 percent. Everyone can’t wait for it to fall below the 5 percent mark, but that won’t happen till sometime later this year or even 2014 (China is delaying the inevitable). At 18.29 percent, Firefox has hit a new low not just for this year. The last time we have seen the browser at 18 percent was way back in May 2008. 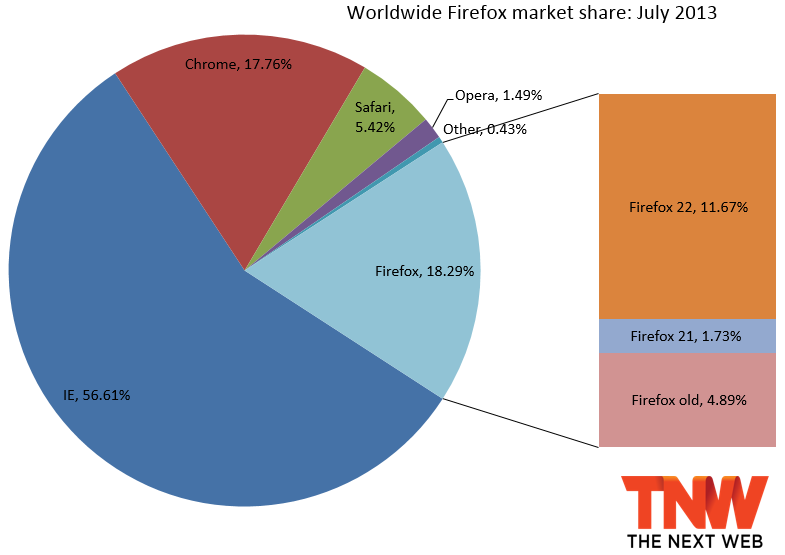 Firefox 22 was available for all of July, so it managed to grab 10.21 percent share as all the other versions lost share: Firefox 21 fell 10.74 points, Firefox 20 lost 0.29 points, Firefox 19 dipped 0.08 points, and Firefox 18 slipped 0.06 points. At 17.76 percent, Chrome has managed to recover quite a bit from its 21-month low in May. Chrome 28 grabbed 8.98 percentage points to start, as it wasn’t available for a full month. All other versions were down: Chrome 27 lost 7.44 points, Chrome 26 slipped 0.26 points, while Chrome 25 and Chrome 24 lost a combined 0.05 points. 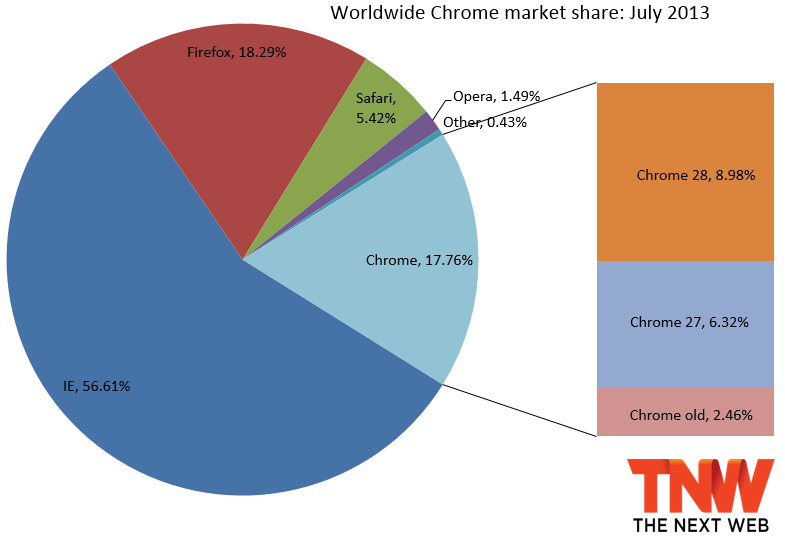 Both June and July have brought back the chance Chrome could finally surpass Firefox this year. Net Applications uses data captured from 160 million unique visitors each month by monitoring some 40,000 websites for its clients. StatCounter is another popular service for watching market share moves; the company looks at 15 billion page views. To us, it makes more sense to keep track of users than page views. Nevertheless, for July 2013, StatCounter listed Chrome as first with 43.12 percent market share, IE in second with 24.53 percent, Firefox in third with 20.09 percent, Safari with 8.59 percent, and Opera with 1.10 percent. The only part everyone agrees on is that Safari and Opera are not in the top three.